Another cinema screen grab of a vehicle which appeared in a film "Og så kom toget!, (And then came the train) a Short Movie made in 1979 where the vehicles are being investigated by IMCDB. -- We can advise that this interesting not-so-little vehicle is a cca 1901 Locomobile Locosurrey Steam Car made by the then new company which had purchased the first set of patents from the Stanley Brothers to make steam cars. Newer wheels as originals would probably have been wires. Photo received from Jim Derham-Reid from British Columbia (Canada) of his mother's Grandfather Forrest Liversey, mill owner, outside his home Shade House, Pendlebury. 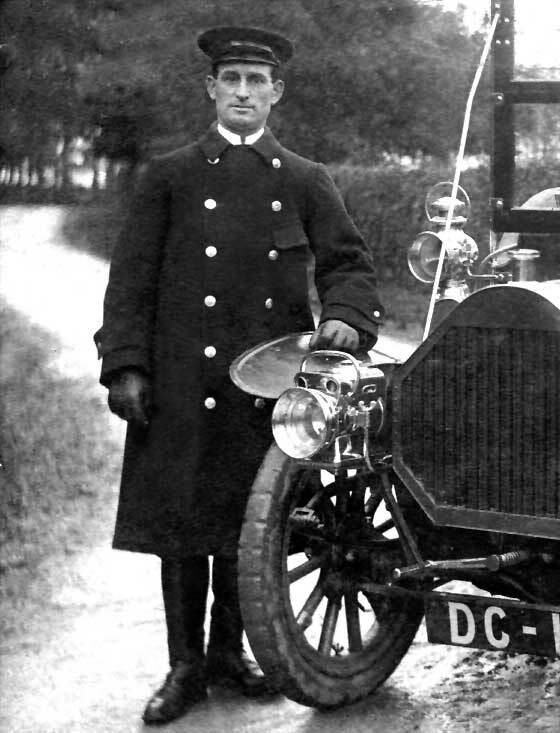 He thought the car was a 1903 De Dion -- Definitely not a De Dion Bouton. Our John Warburton immediately identified it as a very rare Manchester-made cca 1903 Belsize Rear Entrance Tonneau, probably a twin cylinder model. Identifying feature is the curious horseshoe shaped gilled tube radiator at back of bonnet. Very interesting photo received from Malcolm Fare (UK) who is writing a history of the parish of Hanley Castle. Photo shows Sir Edmund and Lady Katherine Lechmere (1865-1937) of Rhydd Court. -- Registration AB 155 is Worcester CC who started at 101; this therefore is the 55th car registered in Worcestershire. 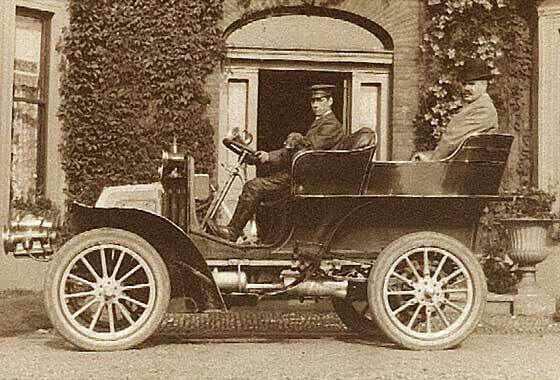 Car is a Wolverhampton built 1904 Sunbeam 12 HP Tonneau. It had a 2.4 litre 4 cylinder water-cooled engine and leather lined cone clutch. It sold for 500 guineas. 76 built. 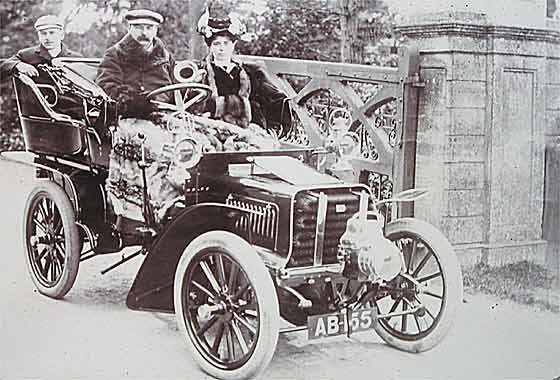 Two photo received from Tony West (UK) of an Edwardian car probably 1905-06, and the driver is his grandfather William Collins, the son of the author Wilkie Collins. -- We have so far not been able to confirm identification and have requested re-scan of the radiator badge area. We are sure this will provide some info. Body would have been made by external coachworks. So far we think French and possibly a cca 1905 Vinot & Deguingand. Registration LC 250 says about June 1905. Very interesting photo received from Malcolm Fare (UK) who is writing a history of the parish of Hanley Castle. Photo shows Sir Edmund Lechmere (1865-1937) of Rhydd Court, suggested as 1906. -- Registration unclear but has four numerals suggesting possibly later, and if C, then Yorkshire. Car is very unusual being a French Lyonais built cca 1906 Pilain Tourer. Pilain had the circular radiator and bonnett and should not be confused with the Rolland & Pillain of Tours, separate co .
Photo received from Pauline Dolling (UK) who had read an article in the Practical Family History magazine, which says that we are willing to help identify cars. 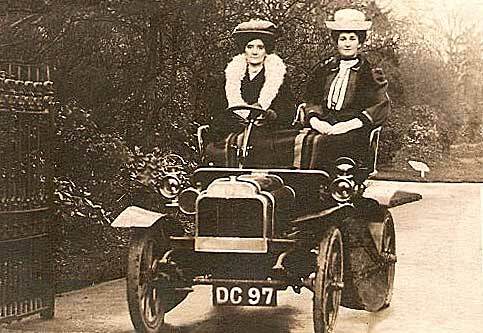 She attached a photo of two of her female ancestors Ada and Annie Halton in a car believed to be a Ford Model T. -- Definitely not a Ford. 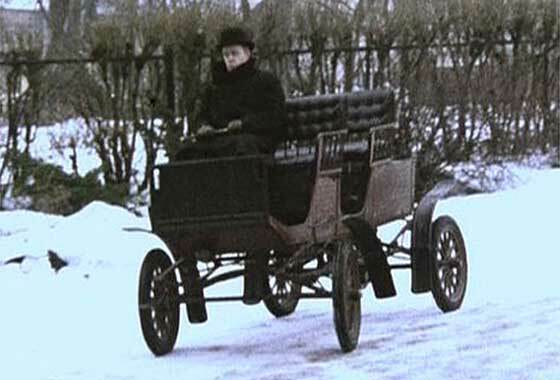 Our John Warburton identified it as a a very rare car indeed, a cca 1906 Gilburt Light Car, only made between 1904 and 1906 in West Kilburn, London. Registration DC97; Middlesborough1906. Somewhat damaged section of a photo received from Ivor Davies (UK) which we have repaired. 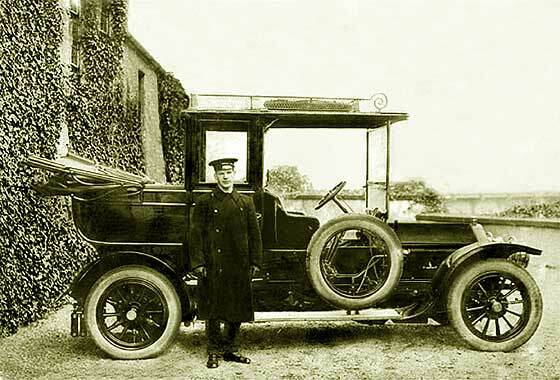 Ivor tells us the picture was taken at Potto Hall in North Yorkshire and has his Great Grandfather Thomas Carter Danby standing next to a car owned by James Richardson Esq. J.P. (Justice of the Peace). Great Grandfather was his domestic servant and chauffeur. Believes incomplete registration is Middlesborough circa 1904. -- DC is Middlesborough but the car is bit later and is a cca 1909 Humber Tourer. 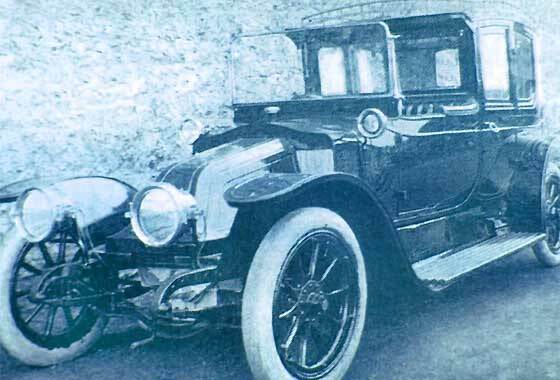 Very unusual car we identified recently is this cca 1911 Scar Brougham. The S.C.A.R. 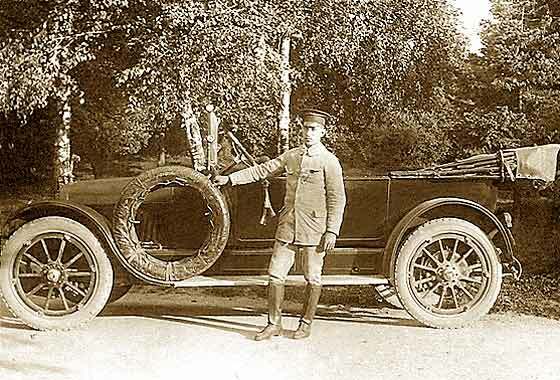 car was manufactured in the Marne region of France perhaps best known for the 'Taxi de la Marne' when Paris Renault taxis ferried the army to battle in WW1. The SCAR works were indeed subsequently blown up by the Germans in 1915 ending production started in 1906. Also in common with Renault, the SCAR had a similar bulkhead radiator after 1910. Sold in UK. After War marketed Mathis. 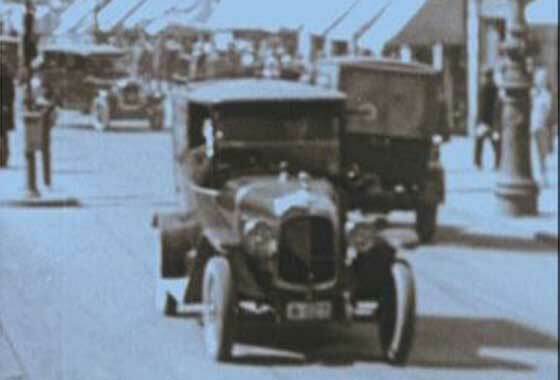 A somewhat pixly blurred photo received from Alan Williams (UK) saying he is trying to identify the motor car. The occupants in the photograph are his Gr Gr Grandparents living in Porthcawl, South Wales. Photo was taken in about 1900-1905. -- Dating is about ten years out. 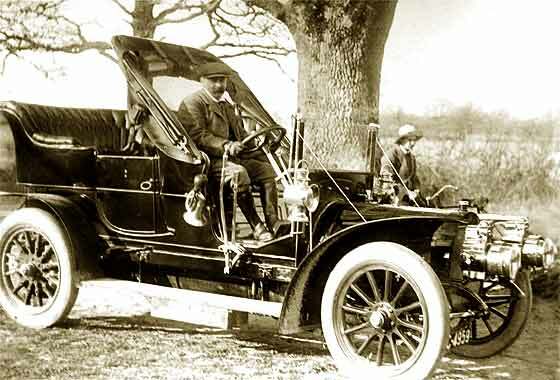 The Car is a cca 1912 Model T Ford Fore-Door Touring registered at Glamorgan CC. Front doors were introduced in 1912. Probably built in April as it has the outside rear door handles, later abandoned due cost. 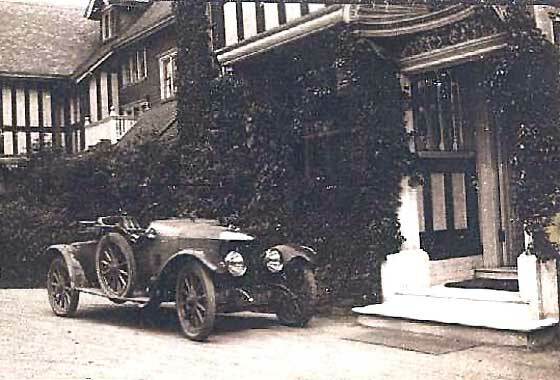 Photo received from Jim Derham-Reid from British Columbia (Canada) of a car at his mother's parents home in Lynngarth, Brooklands, Derbyshire in September 1912, the parents leaving on their honeymoon in what was said to be a Napier. -- Although the photo as received was small and much over-sharpened, the Napier radiator with the tower filler cap can just be seen between the two standing men. Though not all clear, general details would confirm a cca 1912 Napier Sport Roadster. 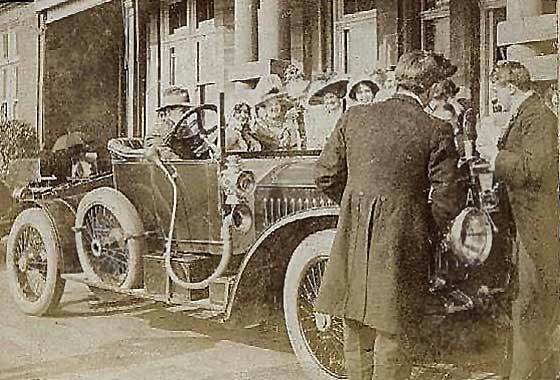 Photo received from Sonia Pegg (UK) of late grandfather, born around 1889, standing by the side of a car taken in the Glasgow area possibly in around 1920. -- We have not been able to provide a positive identification because the all important radiator is hidden and bodies would have been made by external coachwork companies. We requested a larger scan of the wheel nut but have not received any reply. Bonnet handle is indicative of a cca 1912 Wolseley Landaulette. 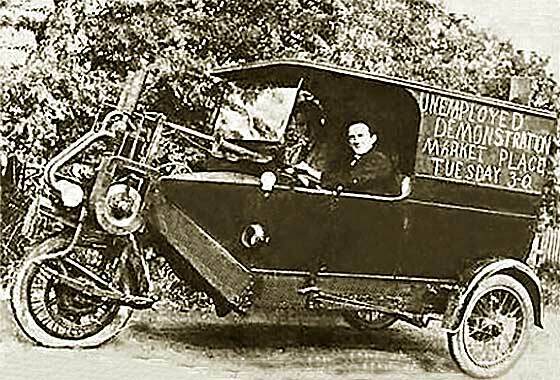 Intriguing and very unusual photo received from Lyton Jarman of Rugby (UK) of a tri-car delivery vehicle, possibly to do with the English Communist Party (?? ), with handwritten slogan on the side saying: "Unemployed Demonstration Market Place Tuesday 3-0". -- No numberplate to show origin. We can however advise that it is a German cca 1913 Cyklon 6HP Cyklonette Delivery Van. Guessing photo is at least couple years later, WW1 would have been in full swing v Germans? Very interesting photo received from Malcolm Fare (UK) who is writing a history of the parish of Hanley Castle and saying he would be grateful to know what make of car is shown. 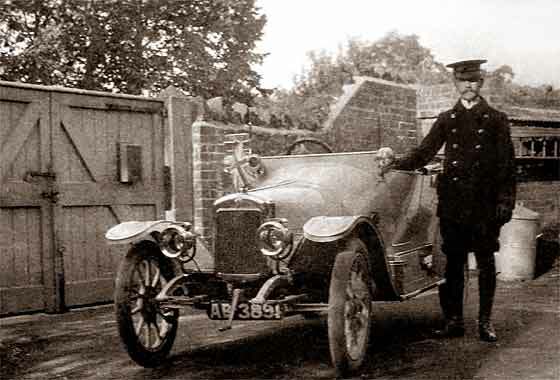 -- Registration is Worcester CC and the car is relatively unusual being a British 1913 Calthorpe Minor Tourer. The 'Minor' name precedes Morris and was introduced 1913. A special version of this same model averaged 68 mph in the 1914 Cyclecar Grand Prix. 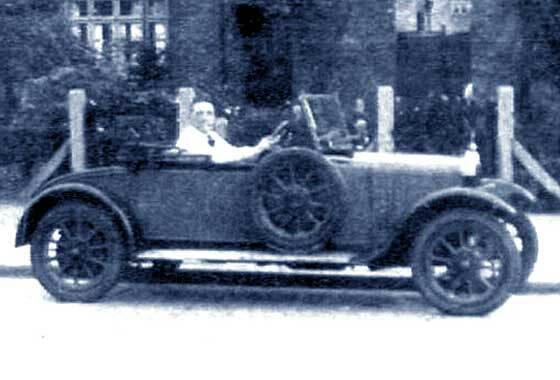 Calthorpes ran successfully in many rallies in the 1920s. 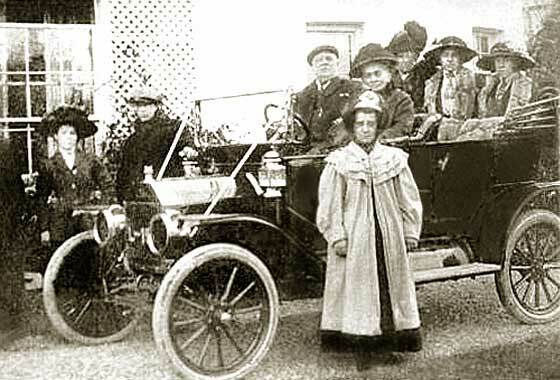 Photo received from Jim Derham-Reid from British Columbia (Canada) of a car at his mother's parents home taken in 1913 in Lynngarth, Brooklands, Derbyshire. Was it a Prince Henry? -- Although the photo as received was small and over-sharpened, the famous Prince Henry radiator can be plainly seen. These 'C type' cars were designed by Laurence Pomeroy for the 1910 Prince Henry Trials. Replicas went on sale 1911 and about 50 were made. Bigger engines in 1913 for 140 cars. Another of a number of very interesting photos submitted by Jan Lundin (Sweden) showing vehicles in the 20s and 30s Scandinavia, for which he is seeking identification and dating. Jan has habit of unearthing unusual vehicles and this is no exception. -- With the help of our friends at the AACA we can confirm that this is a cca 1914 Hudson 6'40 Touring. Confirmation of year is that the hinges are concealed. Joseph Hudson owned 1910 Detroit most successful department store. Lovely period photo of a picnic sent in by David Keller, Historian, Trans-Pecos and Big Bend region of Texas (USA). -- Both vehicles have production chassis and hack bodies. Car on left is cca 1915 Ford Model T; transverse spring, LH drive and electrics. On right did confuse by having an angle bonnet bit Hupmobile but would have been rounded as is a cca 1915 Buick Model 36, from AACA, wheel hub nuts etc. Difficult to advise date of the photo as cars would have been old then to be so butchered. Two more pictures from Claire Dulanty (UK). This photo was taken in Connecticut, USA. They are of her grandparents, Claire's mother (born in 1913), and her nanny. Claire thinks they must just have bought this car, probably their first, and were very proud of it. -- Our friends at the AACA got through the customising to a cca 1915 Overland 81 Touring. Optional wire wheels, headlamps are too big, airvents very strange, and has been hit from the back as rear mudguard seems to be a little bent. Another IMCDB cinema screen grab, this of a vehicle which appeared in a short American part-animated silent film 'Bubbles' made in 1922. 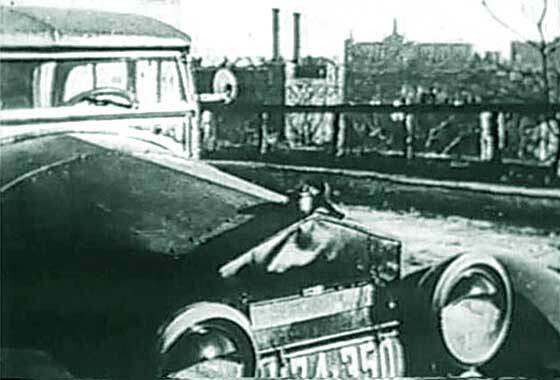 The car shown with the radiator header tank covered in a winter protector is not a Rolls Royce despite the shape of the radiator. The car is American made in Kalamazoo, Michigan, and is cca 1918 Roamer Touring. A number of American and other cars copied the Rolls Royce radiator but what helps with the identification is the largish rivets on the bonnet. Photo received from Stephen A. Barneby currently in (Iraq) with the Regional Reconstruction Team in Erbil. The photo is marked 1912 which Stephen thinks is too early. -- Indeed it is. 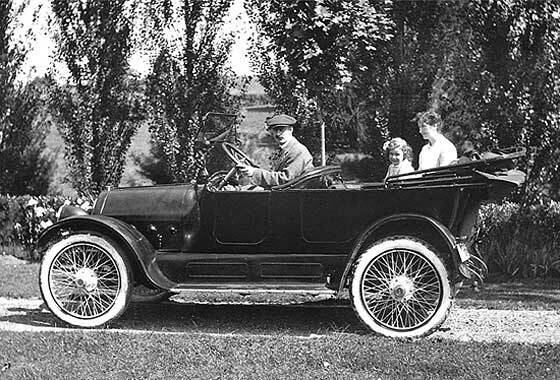 My thoughts were Cadillac but West Peterson of AACA suggested Pierce Arrow. 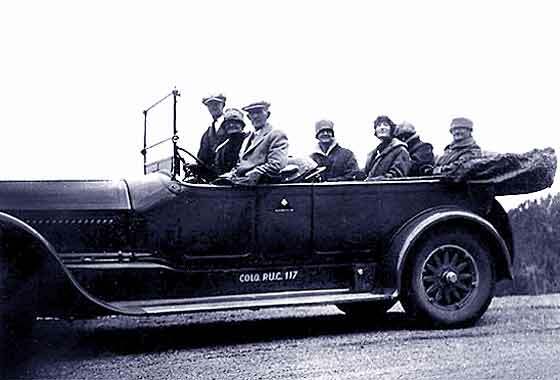 Further research confirmed it was a cca 1919 Pierce Arrow Seven Seat Touring. Year pointer is the narrow louvers on the bonnet and no bulkhead lights. Wheel hub nuts seem to have the shape of the Pierce 'arrow' logo. Another cinema screen grab of a vehicle which appeared in a film "Og så kom toget!, (And then came the train) a Short Movie made in 1979 where the vehicles are being investigated by IMCDB. -- We can advise that this little delivery vehicle is a cca 1920_Citroen C3 5CV Boulongere. One of the smallest and earliest of Citroen cars, 88,000 were made in the production period 1922 to 1926, mostly cars and cabriolets. Commercials were Normande and Boulongere. More info on the Model C.
Rather grainy photo received from Jane Jones (UK). She is researching her grandfather's life and found this photo amongst family memorabilia. She thinks it could date from the 1920's/30's. Her mother remembered that she used to sit in the small folding seat at the back of the car when she was a small girl. Could we identify this car for her? -- We would confirm photo as late 20's early 30s because the car looks relatively new. It is a cca 1923 Standard 11HP Two-Seater & Dickie. This picture originates from Ron Smith in the UK who had sent it to Old Motors Club (Malta) where Anthony Vassallo tried to help. Photo is possibly 1932/33. The driver is Georgio DeSalvo who worked at the Union Club in Sliema, Malta. The girl is Ruth DeSalvo and the background is very Maltese. No DeSalvo now in telephone Directory. Nobody in club could identify car. -- Fortunately the radiator badge/wheel nuts are relatively clear, and headlamps advise c1928 Buick Six Town Brougham. One of three photographs received from Patrícia Carvalho or Paula Roque, we know not which, nor what country she/they were writing from. We have tried emailing to find out more but have received no replies. It is always a shame when our work gets no feedback. 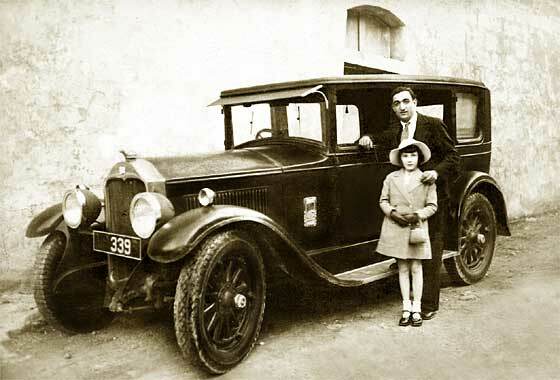 All we know is that the cars belonged to her Grandfather and that they were photographed in Mozambique in Africa during the 1920s, fascinating in its own right. 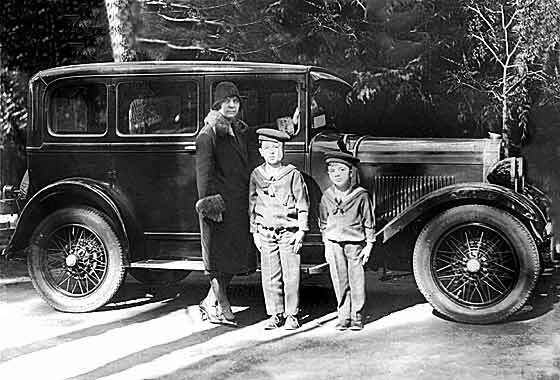 We can advise that this car is a cca 1929 Erskine 6 Sedan. Two more pictures from Claire Dulanty (UK). 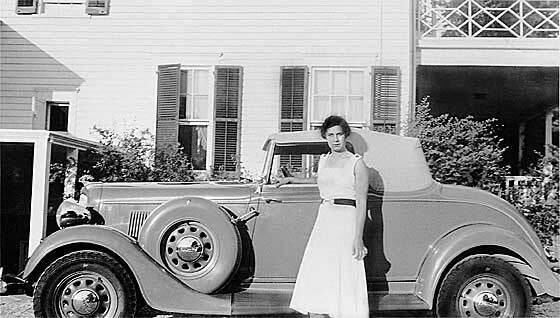 This photo is of a car that was her mother's. She was in London, and the car had been shipped over from the States, - and she loved it. It was apparently cheaper to ship than buy a new one here. She came over to study in September 1935, if that helps. It is possible that it was a bright colour? -- The mascot shows a ship in full sail, the Mayflower. The car is a cca 1933 Plymouth Convertible. Poor sales resulted in number of model changes. Photo received from Lars Nielsen (Denmark) saying he has an antique car headlight, Lucas serial number 754 " King of the Road ". Which car would this lamp have come from? -- Strong patents meant that Lucas lamps were on bicycles, motorcycles, cars, and lorries. The number 754 indicates model which appears to have been a 'side lamp' rather that a 'head lamp'. 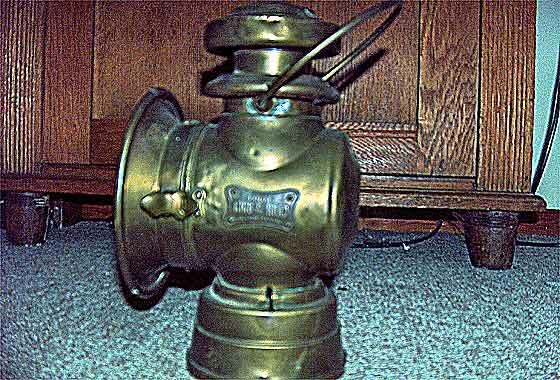 Brief investigation suggests these lamps were used mainly on 'steam powered' vehicles such as Traction Engines or Steam Rollers.